Genuine OEM Epson Maintenance Cartridge,. Epson part number: T619100. 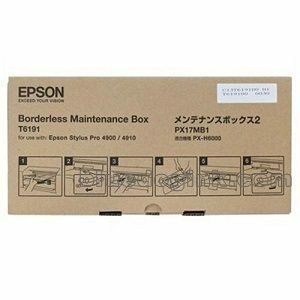 Maintenance Cartridge compatible with Epson Stylus Pro 4900. Genuine OEM Epson Ink Cartridge, Cyan. Epson part number: T653200, T6532. Genuine OEM Epson Ink Cartridge, Yellow. Epson part number: T653400, T6534. Genuine OEM Epson Ink Cartridge, Light Cyan. Epson part number: T653500, T6535. Genuine OEM Epson Ink Cartridge, Vivid Magenta. Epson part number: T653300, T6533. Genuine OEM Epson Ink Cartridge, Green. Epson part number: T653B00, T653B. Genuine OEM Epson Ink Cartridge, Orange. Epson part number: T653A00, T653A. Genuine OEM Epson Ink Cartridge, Photo Black. Epson part number: T653100, T653100. Genuine OEM Epson Ink Cartridge, Matte Black. Epson part number: T653800, T653800. Genuine OEM Epson Ink Cartridge, Light Black. Epson part number: T653700, T6537. Genuine OEM Epson Ink Cartridge, Light Light Black. Epson part number: T653900, T6539. Genuine OEM Epson Ink Cartridge, Light Vivid Magenta. Epson part number: T653600, T6536.